This round will close on Wednesday, June 1 is closed. This round will close on Wednesday, May 18 is closed! This round will close on Wednesday, May 4th is closed. Note: I'm sorry the rules shift around so much; I'm still trying to happy medium to encourage more participation. For this round, you no longer need to turn in a card! See the rules below for more details. This round will close on Wednesday, April 20. This round will close on Wednesday, April 6 is closed! This round will close on Wednesday, March 23 is closed! This round will close on Wednesday, March 9 is closed. This round will close on Wednesday, February 24 is closed. Please note the new rules and posting schedule! This round will close on Wednesday, February 10. is closed! Due to the lack of responses, the previous round will stay open for an additional week. The rules will also be changed for this round to one word comments, to hopefully facilitate more participation. In addition, leaving feedback on this game (are the rules too complicated? would you like one word comments to be the default? would changing the schedule to biweekly help? let me know!) will earn you an extra three cards! 1) Each comment must be at least one sentence long, and must contain the deckname, or variation of, from the post preceding yours. For example, for the deckname Acting, possible words include acting, act, actor, acted, etc. 2) For each post, you must turn in a card to prompt the next person. You will lose this card! 3) For your sentence(s) and card, you will receive four of the color of your donated card. For special cards, you will receive two cards of each color. 4) There is no limit to the number of times you can post, but there must be at least two comments in between each post. 1) Post one word in your comment to continue the story. 2) For your word, you will earn one card. 3) There is no limit to the number of times you can post, but there must be at least two other posts in between each of yours. Happy holidays, sleepy holidays~ Since there were no responses to the last round, it will remain open for another week (closes December 30) with an increase in rewards. 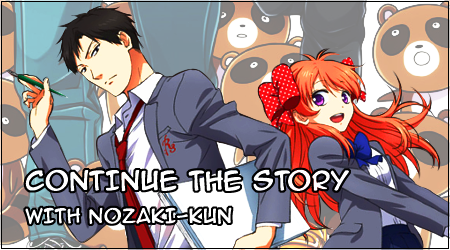 Each week, a new character will come forth with a story to inspire Nozaki-kun, and your job is to 1) continue the story where the previous person left off; and 2) turn in a card to prompt the next person of what happens next. 3) For your sentence(s) and card, you will receive four SIX cards of the color of your donated card. For special cards, you will receive two THREE cards of each color. 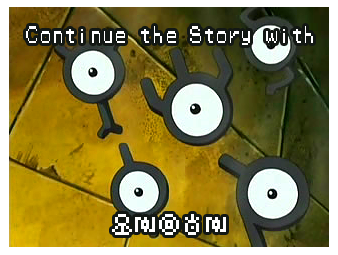 The Unown had a great time listening to all your stories and want to pass on a huge "Thank you!!" to everyone for sharing their fun tales. But now they've returned to the Ruins to share your stories with all their friends back home, so we have a change in hosts! 3) For your sentence(s) and card, you will receive four cards of the color of your donated card. For special cards, you will receive two cards of each color. This round will close on Wednesday, December 16 is closed! This round ends June 16th! This round ends April 28th! As a note, the previous round is still up until the 24th!